Celebrating the life of Angelo J. Feldkamp, O. Praem. Obituary for Angelo J. Feldkamp, O. Praem. He received a B.A. degree in Latin from St. Norbert College, De Pere, WI in 1965 and a M.S. degree in Counseling from University of Wisconsin - Madison in 1975. 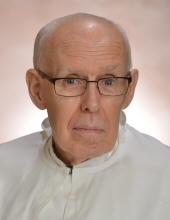 He is survived by the Norbertine Community; brothers Larry Feldkamp, Wrightstown, David (Pat) Feldkamp, Kaukauna, one sister, Karla (Vernon) Gebhart, Hilbert, numerous nephews and nieces-in-law. To send flowers or a remembrance gift to the family of Angelo J. Feldkamp, O. Praem., please visit our Tribute Store. "Email Address" would like to share the life celebration of Angelo J. Feldkamp, O. Praem.. Click on the "link" to go to share a favorite memory or leave a condolence message for the family.